Play through the extensive main campaign, containing seven scenarios, as well as a stand-alone scenario, The Masquerade. Each scenario, or chapter in the story, will take you to a new part of Eisenwald and present new challenges to overcome. The decisions you make affect how the story plays out with several paths and endings. The combat system is heavily streamlined to create a dynamic form of turn-based battle that maintains all the tactical benefits of a turn-based system but a much faster pace of play that removes the frustrating moving between attacks. Combat feels much more like an RPG than a strategy game but provides a greater degree of tactical depth and flexibility than similar games. 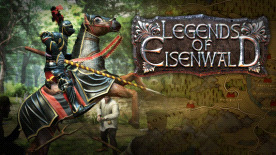 Legends of Eisenwald is set in a believable medieval land featuring supernatural elements. Rather than the high fantasy worlds of elves and dragons, Eisenwald is based on the concept of how the world would look if all the medieval superstitions turned out to be true. You’ll encounter witchcraft, terrifying creatures and mystery on your journey but the world is driven primarily by human motivations and politics rather than mystical powers. Enjoy deep skill-trees and multiple options for customising your character and army as you progress through the game. Choose from three distinct hero classes in the Knight, Mystic or Baroness and then equip and develop your hero and troops to your personal taste and play style. A main campaign with seven scenarios as well as the standalone scenario of The Masquerade will be included in the game at launch, providing more than 30 hours of gameplay and a significant amount of replay value beyond that due to the non-linear story and impact on the combat from your choice of hero class. All the core gameplay mechanics are integrated and live, although we are still working on polishing and refining these based on your feedback. English, German, French and Russian language support is in for the Prologue and Masquerade scenario. English and Russian support is in for The Way Home scenario. The final game will contain a campaign consisting seven scenarios including the prologue and will support English, German and Russian languages at launch.